For years, Elon Musk and Tesla have been revolutionizing the automobile industry. Now Tesla is poised to disrupt the roofing industry with a new solar product. The company acquired Solar City. Tesla said it will be using that solar technology to create a new type of roofing shingle made of tempered glass that will harness the energy of the sun to power homes. Instead of using the big solar grids that we think of now for solar roofs, the Tesla roof will have individual shingles made of textured glass. The tiles will mimic the look of shingle or roofing tile, and they will be tempered so that they are less brittle. The tiles will be resistant to damage and are expected to last twice as long as current roofs, which will save homeowners even more money. In addition, the solar tiles will weigh much less than traditional roofing materials, so they will cost less to ship and they will be able to be installed on more properties. Though the Tesla solar roofing system seems promising, it is unlikely to be a reality for many homeowners for many years to come. Pricing for the new solar system has not been confirmed yet, but industry insiders say that the panels will cost as much as 20 times more than asphalt shingles, which are the most economical roofing material for many. Right now, that cost is far too much for the average homeowner to afford, even with the reduced shipping costs that Tesla promises. However, we do see this as a first step toward a brighter future for roofing. As the technology improves and the roofing materials are used by more people, the overall cost will come down, making it more accessible for everyone. Eventually, the majority of people will be able to afford this roofing technology or something very similar, and they will enjoy greener roofing that also saves them a lot of money on their energy costs. The roofing will be better for the environment and better for everyone’s wallet. For now, homeowners can save money and get green roofing materials with options like recycled shingles, foam roofing, or traditional solar panels. Whatever option you choose, it is important that you work with an experienced North Phoenix roofer with the skill to install that roofing type. 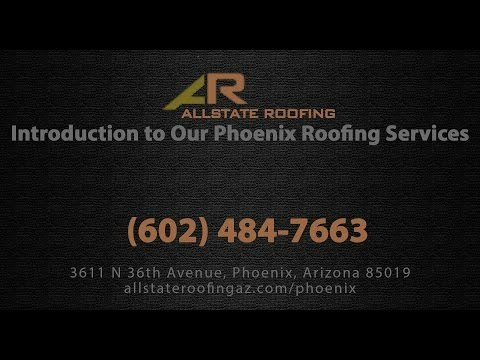 Allstate Roofing is a top roofing company in Arizona. Our experienced North Phoenix roofing contractors have the skills and training to perform roof repair in Phoenix and re-roofing on a wide variety of roofing types, including traditional and environmentally friendly options. Our roofing contractors in Phoenix are known for their attention to detail, high quality of workmanship and exceptional service. They perform roof repair so that it preserves the structural integrity of the roof, and they counsel on re-roofing so that you get the best option for protecting your home on the best budget. Call us today to get a free estimate for your roof repair or re-roofing job in Arizona.